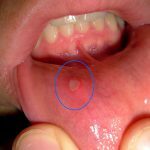 Minor inflammatory patches in the mouth or mouth ulcers are no exception. Mainly affect younger people under thirty years old and appear as whitish sores with red edges on the size of about 0.5 cm2. Although not a serious disease, their occurrence is painful, especially when larger size may make it impossible aft meal or speaking. Mouth ulcers are likely to be due to a lack of certain nutrients. Most often it is a lack of one of the B vitamins, which act favorably on the renewal of the mucous membranes. There may be a lack of iron or overall poor nutritional status of the organism. Therefore, they can also occur in severe illnesswhen the body is overburdened physical stress. Some individuals may have sores in the mouth as aresult of aggressive sensitivity to toothpaste or mouthwash, or to certain foods such as nuts or spicy food. They should not during the occurrence aft consume, because of their irritating surface and difficult healing. Inflammatory patches larger scale known as scurvy nowadays virtually absent. Arise from failure of collagen synthesis due to prolonged vitamin C deficiency. This is contained for example in an acidic fruit, paprika or darts.